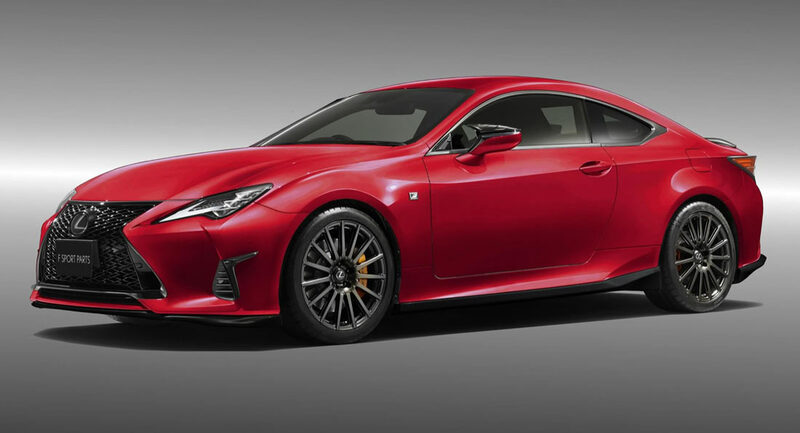 The RC F may not hold the same appeal as the BMW M4 and Mercedes-AMG C63 for most buyers in Europe and the U.S., but Lexus has introduced a bespoke TRD bodykit for the sports coupe that makes it that little more desirable. The optional body parts, which are available solely in Japan, start at the front with a subtle front splitter that easily attaches to the bumper and not only adds aggression but makes it appear as though the RC F’s ride height is lower than it really is. At the front, Lexus has also designed new plastic ‘canards’ below the headlights that are finished in gloss black plastic. Moving to the sides, TRD has designed new aerodynamic mirror covers again finished exclusively in gloss black plastic. Buyers will also have the option of distinctive side skirts that further broaden the appeal of the vehicle. For $5000, a set of 19-inch forged aluminum wheels are also available, measuring 19×8.5 at the front and 19×9 at the rear. Despite the hefty price tag, the tires are not included, which means you’ll have to pay extra. Completing the available styling parts are a new rear diffuser and a rear lip spoiler made from lightweight carbon fiber. Some performance-oriented parts are also now available from TRD. These include a $5800 sports muffler, steel bracing under the body and a new performance damper brace at the rear. The RC F, which recently received a subtle facelift, continues to use a naturally-aspirated 5.0-liter V8 engine delivering 477 hp. While that’s a lot, the engine is required to haul an extra 300 kg (661 lbs) over rivals such as the BMW M4.